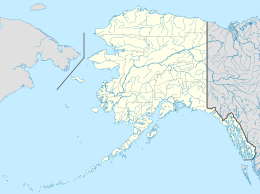 Unimak Island ( Aleut: Unimax ) is the largest island in the Aleutian Islands chain of the U.S. state of Alaska. It is the easternmost island in the Aleutians and, with an area of 1,571.41 square miles (4,069.93 square kilometers), the ninth largest island in the United States and the 134th largest island in the world. It is home to Mount Shishaldin, one of the ten most active volcanoes in the world. According to the United States Census Bureau, there were 64 people living on Unimak as of the 2000 census, all of them in the city of False Pass at the eastern end of the island. Cape Lutke is a headland on the island. Cape Pankof is located at the extreme southwest of the island. The Fisher Caldera is a volcanic crater in the west-central part of Unimak. Some characteristics include many volcanic cones and undrained lakes. It is named for Bernard Fisher, a U.S. Geological Survey geologist who was killed in Umnak Pass. Mount Westdahl, 5,426 feet (1,654 m) in elevation, is a stratovolcano of the Aleutian Range on the island. When the Alaska National Interest Lands Conservation Act was passed on 2 December 1980, 910,000 acres (370,000 ha) of the island was designated as wilderness. This area is managed by the United States Fish and Wildlife Service. As a faunal extension of the Alaska Peninsula, Unimak has a relatively diverse assemblage of terrestrial mammals, including Alaskan brown bears and caribou. West of Unimak Island, the largest native mammal in the Aleutians is the red fox. Cape Sarichef Lighthouse is also on the island. Shishaldin, Isanotski and Roundtop volcanoes as seen from the Unimak Pass in morning light. Pogramni (6569ft, 2002m) volcano as seen from the Unimak Pass in morning light. Shishaldin (9373ft, 2857m) volcano as seen from the Unimak Pass in morning light. Isanotski (8104ft, 2470m) and Roundtop (6128ft, 1871m) volcanoes as seen from the Unimak Pass in morning light. ^ "Unimak Wilderness". Retrieved 2014-11-17. ^ Prints of Poetry - A Gratitude Company (1946-04-01). "Ak - Scotch Cap Lighthouse". Titanic-nautical.com. Archived from the original on 2010-06-27. Retrieved 2017-12-16. Wikimedia Commons has media related to Unimak Island.